Ripe tomatoes, salty mozzarella and fresh basil – why mess with perfection?? Normally I would agree but just like the potato salad this summer classic can get a little boring after a while. While the tomatoes are still abundant and my garden is busting out with basil I tried to think of different ways to highlight this awesome combination. First lets start with the basics – if you are going to make a classic caprese please please make sure to pick the best farm grown tomatoes you can find. Heirlooms are great here and also provide some different colors and shapes to the equation. For the mozzarella it must be fresh, not the blocks you find shrink wrapped in the super market. Buffalo mozzarella is the best for this application (no, not buffalo like the wings, buffalo like milk from buffalos) as it’s the softest and most flavorful. Then just layer it with fresh basil leaves, a sprinkle of salt and pepper and you are all set. Nothing wrong with going this route, especially if you pick the best ingredients but I can never leave well enough alone. My first twist is pretty close to the original, it’s just different in its presentation. I think this tomato fan version would be great for a dinner party. Instead of a large family style platter of caprese, with this version everyone gets their own. For this twist just buy as many tomatoes as you have people coming to dinner and figure about one 8 ounce package of mozzarella for every two tomatoes. Then just slice the tomatoes about 3/4 of the way down with the stem end on the bottom. Count up how many slices you have made and then cut the mozzarella accordingly. Tuck one slice of mozzarella and 1 basil leaf in each slice carefully. Then I just sprinkled them with salt and pepper and a little balsamic vinegar. Delicious and a great make a head – you could do these an hour or two before your dinner party and impress the pants off of everyone. Just don’t put them in the refrigerator – you know you NEVER put tomatoes in the fridge right? Totally kills the flavor. The next twist takes liberties with the main components. 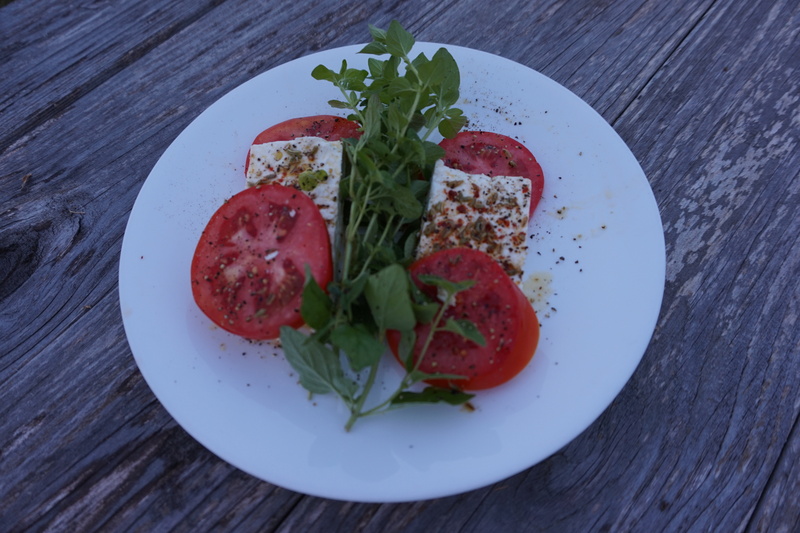 This is my greek caprese that swaps out feta for the mozzarella and oregano for the basil. To add a little more flavor I drizzled the feta with a little olive oil, fennel seeds and red pepper flakes. This was perfect for a light picnic dinner by the bay. Last but not least is actually the easiest but also the most flavorful and impressive looking. 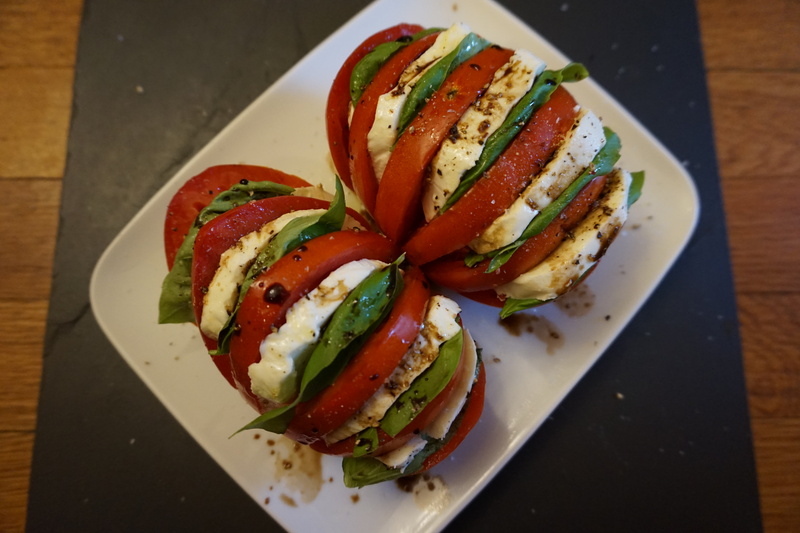 Here we take the mozzarella and tomatoes and miniaturize them and swap out the basil for basil pesto. I used flat-bottomed wine glasses but you could use a mason jar or any other clear bowl or glass to the same effect. Put about 1 to 2 tablespoons of pesto at the bottom of the glass, basically enough to cover the bottom and for you to see the green along the side. 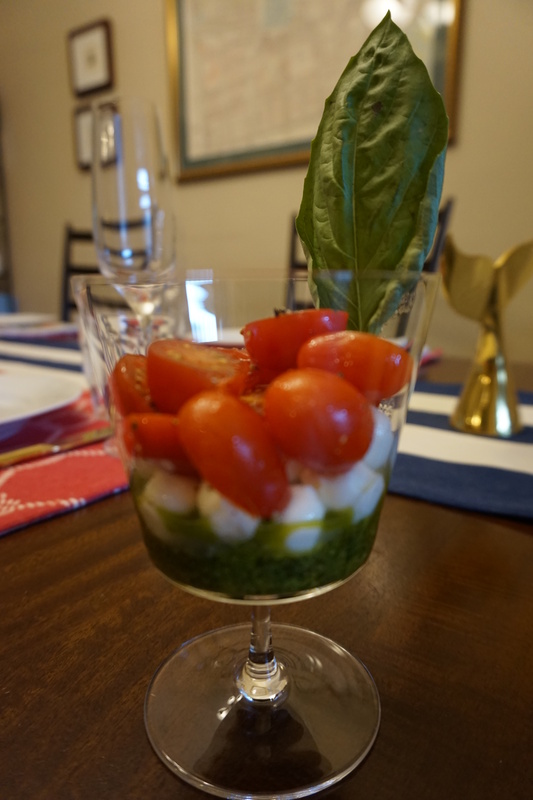 Top with a handful of mini mozzarella balls, then cherry tomatoes that have been cut in half. I garnished with a basil leaf to gild the lily but these are pretty cute on their own. A couple other twists to consider – using smoked mozzarella, tossing cooked pasta with cherry tomatoes, torn mozzarella and basil, or making crostini drizzled with basil oil and topped with chopped tomatoes and mozzarella. Have fun with it and report back before tomato season ends! Sources for the main photo: placemats are from Home Goods but One Kings’s Lane has good options like this or this; Navy Stripe Table Runner from Crate and Barrel; the drinking glasses are Duralex and are kid and kitty proof; the Viv Champagne flutes from Crate and Barrel; Seersucker Napkins from Food 52; Izon Gold Flatware set from Target. Only one comment on this post. Last night I mixed together heirloom tomatoes cut into chunks, small pieces of fresh mozzarella, strips of basil and blanched green beans cut into 2″ strips. Topped with olive oil, sherry vinegar, salt, pepper.